Medical Tourism Corporation team visited Hospital Angeles in Tijuana, Mexico. This hospital is part of the largest private hospital chain in Mexico. 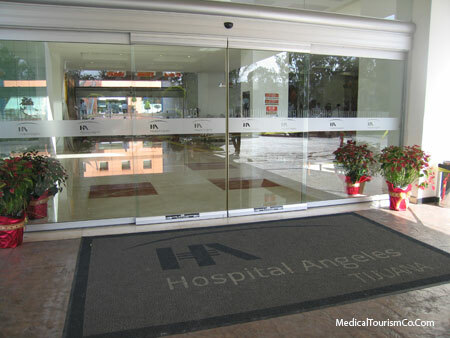 Procedures offered to medical tourists at this Mexican hospital are Gall bladder Removal, Inguinal Hernial, Umbilical Hernia, Incisional Hernia, Lap Band Inamed, Lap Band J&J, Gastric Sleeve, Gastric Bypass, Arthoscophy, Arthoscophy (Outpatient), Knee Replacement, Hip Replacement and Hip Resurfacing. It took us less than 25 minutes to drive from the San Diego airport to the hospital. Hospital Angeles, Tijuana, is a world-class hospital designed especially to provide state-of-the-art medical care to international patients. The hospital boasts one of the best doctors in its field, supported by an able staff and latest medical technology equipment. Hundreds of people visit Hospital Angeles in Tijuana for Lap Band , gastric bypass & gastric sleeve weight loss surgery. The 118-bed hospital has 97 private rooms and is located in an upscale area. It is the first fully integrated hospital in Baja California, meaning it offers complete medical services in-house (outpatient clinic, emergency room, pharmacy, intensive care unit, intermediate ICU, neonatal ICU, intermediate neonatal ICU, X-ray, tomography, MRI, nuclear medicine, fluoroscopy, angiography, fully-equipped laboratory, helicopter landing zone, and medical offices where 135 board-certified doctors practice). More than 50% of the current patients there are from United States. The hospital is self-contained with its own cafeteria, a pharmacy, ATM, chapel and more, thus providing you everything that you may need during your stay. This is also a major reason why it’s such a popular medical tourism destination in Mexico. And if you crave for good old American fast food, McDonald’s & Peter Piper Pizza are walking distance from the hospital. And then there is a Cine Mark across the Hospital, too. Not sure if it shows any English movies, though! For people missing a discount club shopping, Sam’s club is around the corner! Hotel Marriott and a few luxury Mexican Hotels are close by. These are used rarely by the hospital patients, as the patient and one accompanying guest are accommodated in the hospital. The hallways, waiting rooms, corridor and patient rooms and suites are kept sparking clean and give an impression of a five-star hotel and not a hospital. The walls are decorated with brightly colored abstract art by Tijuana painters. A lot of work, thought and attention to detail have gone in the interior design to make the aura uplifting and the hospital patient-friendly. The signs are in English and Spanish; many of the staff speak English. For US patients, a dedicated English-speaking staff member is assigned. The hospital takes special care of its doctors to ensure they are relaxed and are at their best when serving the patients. There is an exclusive hospital club area for doctors that includes a relaxing lounge, exercise gym, jacuzzi, swimming pool, sauna and more. Medical Tourism Corporation facilitates medical trips to some of the world’s leading hospitals including Hospital Angeles, Tijuana.